If you were hoping the DB10 from Spectre would make it to production, now is your time to celebrate. A recent finding by AutoGuide, aka patent central, has uncovered something that may be of interest to James Bond and those who like the cars he tends to drive. After delving into a Japanese patent office, the sleuths found sketches filed by Aston Martin depicting a front-engine two-door sports car that’s too small to be a Vanquish. It obviously cannot be the DB11 either because that’s been out long enough to get a second engine option, so that leaves the Vantage, which this car appears to replace perfectly. There’s little assurance that this is the Vantage we’ll see hit the show floor whenever Aston Martin plans on revealing its entry level grand tourer since patent images don’t always make it to production. At minimum, it gives us insight into the thought process Aston Martin’s designers are going through and we’re intrigued to say the least. The front end reminds us of a few designs Aston Martin has been toying with lately, namely, the DB10 we saw in Spectre. However, the frown up front has been refined from the one on the DB10, making it look more like the front end of the Aston Martin Vulcan hypercar. The rear end sticks closely to the one on the DB10, but the sides still look characteristically Aston Martin. 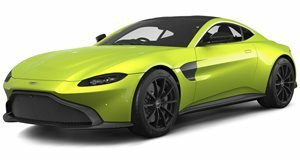 To build the Vantage, Aston Martin will shorten the DB11’s aluminum platform but retain enough room up front to house the 5.2-liter twin-turbo V12 made in-house by the British automaker. It should go without saying that the twin-turbo 4.0-liter V8 that Aston Martin has been buying from AMG will be available as well. Lovers of a clean grand touring drive will be happy that a manual transmission will be offered along with an automatic, a given since Aston Martin has promised to cling to the three-pedal setup even if it’s the last automaker to do so. No mention on when this Vantage will see the light of day, if it ever does, but expect a Vantage reveal of some sort to happen within the next year or two if Aston Martin hopes to keep up the pace of its ambitious plans.